"The greatest gifts are often the most unpleasant burdens ..."
You know you're not a normal person. Somehow, you've always known. You're able to do things that most people wouldn't even dare to dream off but, this gift, this grace, is, at the same time, the cause of a horrible condition that keeps you confined in a small cabin situated on the third investigation floor of the spacial station Morrella. You were born in this masive technologic titan that orbitates the star Alpha Velpeculae and all your contact with the outside world it's been through the scientists that, for many years, have been trying to find the cure to your illness and an explanation to your superhuman powers. The routine of your days grants you a strange comfort. You've learnt to endure the tests, the exhausting practices and the experiments, you even feel grateful to be able to help others in your position. But that is over. It ended the day that routine was broken in the most horrible way to reveal that it was hiding a truth that you never imagined, a truth that you could only escape by yourself. 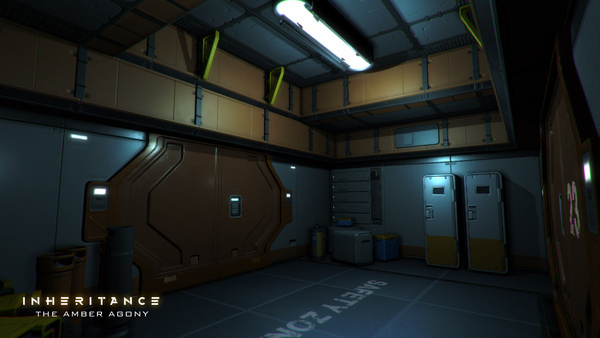 Set in a massive orbital station where you'll feel completely isolated. A delight for all the horror and sci-fi lovers! INHERITANCE: The Amber Agony is being developed for #blackcubejam2016 by a team of 4 persons during 6 days. i am interested! Linux supported ? Currently is only a demo and it's only for Windows, sorry. I finished a gameplay of this game. For a Unity Development I am pleased with the graphics but I did feel it was short, will there be more of this game so I can follow and update my videos? is this the final version or is it a demo that you will build up on? It's the game jam version. We are developing a demo with more gameplay.